We finally know how Facebook plans to encourage websites to allow Facebook to host their content on Facebook, rather than simply linking to their website directly… and it comes down to the revenue share Facebook is offering. 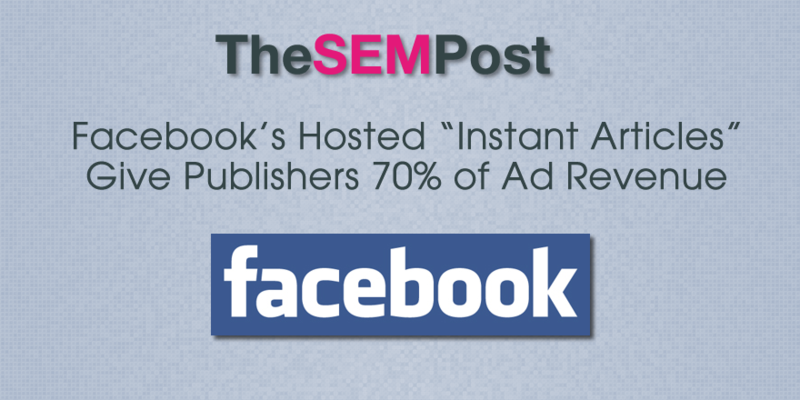 In exchange for the articles being hosted by Facebook – through a program officially called Instant Articles – Facebook will give the publisher 70% of the ad revenue, while keeping 30% for themselves. But as an added perk, if the publishers sell the advertisement, they get 100% of that revenue. We first heard about Facebook wanting to host content from third party news sites back in March, when they were in talks with Buzzfeed, The New York Times and National Geographic. Now it appears the Instant Articles program is set to start as early as this month. For Facebook, the advantage is keeping the traffic on their social media platform rather than sending them off to a third party site. And it alleviates one of the frustrations for users, particularly with slower mobile connections – the slow load time of some websites that Facebook users click through to. But, those publishers would lose the Facebook traffic, along with additional shares from those readers on platforms such as Twitter. And they would also likely lose features such as newsletter sign up forms and search boxes when Facebook hosts their content. So publishers would need to clearly evaluate just how much value a current visitor referred by Facebook is worth, and ensure that the 70% that Facebook is proposing for Instant Articles is worth it. The 100% of ad revenue if the publisher brings the advertiser to the table is a pretty interesting model. Obviously Facebook is hoping they can then convince those new advertisers to also advertise elsewhere on the platform, and chances are they would probably succeed. There is also concern amongst publishers about how much control they will have over the look and feel of the experience, and whether they can keep branding similar in the Instant Articles. It is unknown what type of reporting or analytics Facebook plans to offer these publishers, or if it will be easy for them to extract themselves from the deal if they find the revenue through Instant Articles isn’t worth the loss of actual traffic. It is also unclear whether these Facebook hosted articles might be excluded from the usual reduction in organic exposure that Facebook Pages have been seeing. If these Instant Articles are not subject to the organic reduction, it might be worth it for these publishers to use Instant Articles and get their content to more users than they would otherwise.